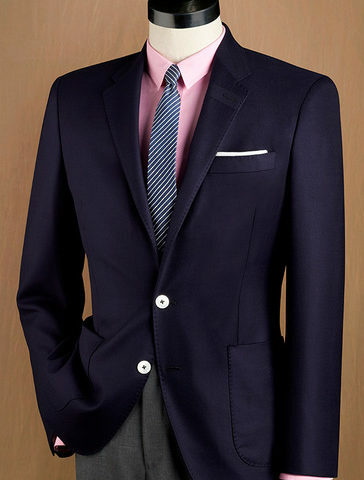 Navy blazers are some of our favorite wardrobe pieces, because they are almost endlessly versatile. They're equally appropriate for social events and for business-casual days. To create a dressy look, pair your blazer with tan, olive, or gray trousers. A range of gray tones, from silver to charcoal, will look great with your navy blazer. Tan trousers can likewise work for several shades, from beige to tobacco. To create a less formal-but still stylish-look, wear them with dark jeans and a crisp white shirt; skip the tie and unbutton your collar. When designing your custom navy blazer, you can select traditional brass buttons, or choose from among a range of brown or gray horn buttons. 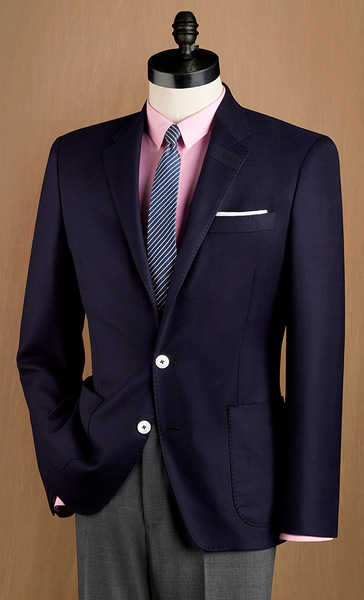 Even though you're building the blazer in a traditional navy color, the fabric doesn't have to be boring-you can easily customize your blazer by selecting a fabric with rich texture. This attention to design detail will create a one-of-a-kind blazer that will set you apart every time you wear it. A navy blazer and a black blazer are great companion wardrobe pieces because you can wear the same trousers colors with both. These two blazers double your mix-and-match potential, and should be part of every stylish gentleman's wardrobe. Question: Is it okay to roll up my shirt sleeves? Answer: Rolling up your sleeves keeps the cuffs clean when you're eating or washing your hands. It's also a great way to dress down an outfit when going from an office atmosphere to after-hours social engagements. However, there's definitely an art to it. Here are a few tips on how to roll up your sleeves yet keep your shirt looking great. It's best to fold sleeves-don't roll them. Make sure both sides end up even in length, and don't roll sleeves up past your elbows. Unroll them as soon as possible to avoid excessive wrinkles. Don't roll up sleeves when in important business meetings, when you need to look as polished as possible. Sleeves should also be worn down to the wrist when wearing a coat or vest, as well as when dressed in formal attire.